Though I only drove my car for a few minutes over the past few weeks, it seems that I magically acquired much improved driving skills, sufficient to pass the test with flying colors. Now, apparently thanks to the beneficent tutelage of the DLD, I am such a wondrously improved driver. Now I suddenly and inexplicably deserve to be granted the privilege of driving without my mommy to accompany me, after my initial execrable performance and abject failure. But not without significant cost and compromise. The DLD deigns to issue me a "license" - albeit with a multitude of arbitrary restrictions that make it well nigh to useless. I still cannot legally drive to my doctor's office or hospital. Nor can I even drive to the Springville Walmart without running afoul of the restrictions. Driving to Salt Lake Valley to visit my children is out of the question. After she notified me that I passed the test, I complained about all the unwarranted restrictions to the examiner, who seemed astonished that anyone would be so ungrateful about being presented with such a charitable gift. So she dutifully summoned her supervisor to confront me with bureaucratic stonewalling, and berate me for my gauche. The supervisor said something about "having a conversation", then proceeded to discount every word I said, effectively granting me her beneficent permission to shut up and go away. She offered no reasonable justification for any of the arbitrarily imposed "restrictions". I had to laugh when the woman bristled at my characterization of their segregating the group of "normal" drivers from the "impaired" to target for discrimination. Her retort, "Do you realize what a SERIOUS charge you're making!?" As if I was somehow offering insult to her virtue and integrity. I am using exactly the same language used in the State of Utah laws which the DLD uses to codify and justify discrimination against handicapped drivers. She claimed that the State of Utah DLD is the guardian of "safety" - even though none of the "restrictions" they were imposing had anything to do with any demonstration of "safety" issues. 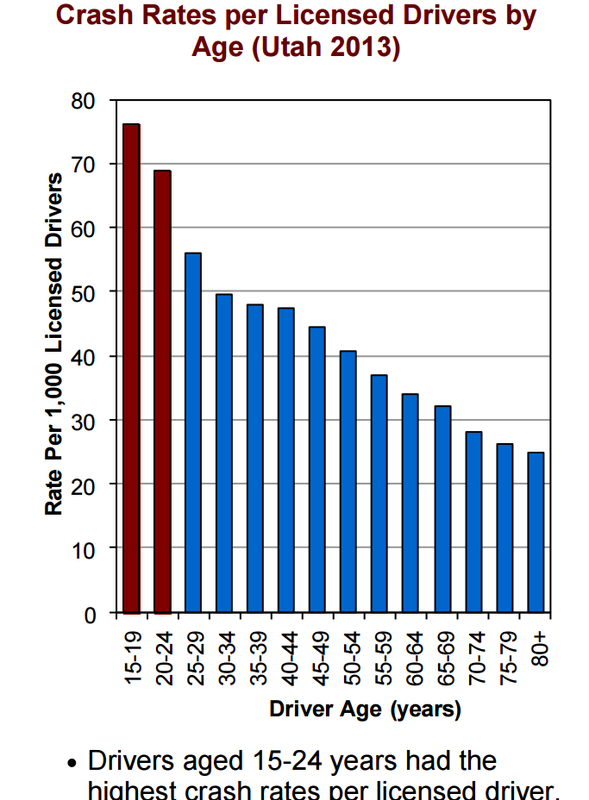 Indeed, the drivers who are recognized by the Utah Department of Public Safety as the most accident-prone of all generally enjoy perfectly unrestricted driving privileges, right up to the moment when they murder somebody. What a brilliant "SAFETY" program! In this round, the insistence on head-swiveling continues. The examiner KNOWS, in her heart-of-hearts, backup cameras are no substitute for turning your head around 180 degrees, even though this virtually eliminates the usefulness of a backup camera. The NHTSA has mandatory required backup cameras in all new vehicles starting next year. But the DLD still knows better. The examiner says, "Don't you DARE look at the backup camera while backing." Even though in the vehicle I drove for this test, the view through the back window that the examiner insisted I should use is severely limited and unreliable at best, even NOT SAFE to rely on! Need I add that this is a totally regressive mindset. I daresay it is typical at the State of Utah DLD. The Federal government mandates that all cars have backup cameras starting this year, but the State of Utah DLD still insists that we must never use them. Not only does the DLD examiner insist on swivel heads, she maintained her pretence that she could not change the driving test requirements to omit parallel parking. I demonstrated my parallel parking skills by the curb on the street next to the DLD office, and asserted that this is the only type of parallel parking I am ever likely to attempt. Nonetheless, she still insisted that I try to park between the DLD cones. I asserted numerous times that my physical handicap precludes any facility at such manuvering, but she continued to insist that it is a mandatory part of the driving test. Even though other parts of the test are routinely omitted. I made a token pass at parking between the cones, and she predictably construed my "failure" as a driving test violation, with an imposed penalty. I could not care less about parallel parking. It would be fine with me if the DLD imposed a restriction on my driving license that explicitly restricts me from attempting to park between two cones. I am happy to stipulate that I cannot and will not ever be able to perform parallel parking, by the DLD definition. I would not even object to any number of other restrictions that prevent me from legally attempting things I am not physically capable of doing. But the insistence that I must perform the parking attempt on the driving test is obviously symptomatic of a greater problem at the DLD. Not one of these listed restrictions makes a particle of sense - in fact, they are the height of absurdity. I implemented the hand controls myself. None of the "restrictions" have to do with anything remotely related to "safety". The examiner's supervisor at the DLD defended their arbitrary requirements, asserting that I raised no objection to them when they were originally imposed. Well, excuse me, but I do not recall that you were present at the time. I most certainly DID object to the restrictions. At the time, I had no reason to believe that the DLD practices routine discrimination against handicapped drivers. Now that I have experienced it consistently, I recognize blatant discrimination for what it is. 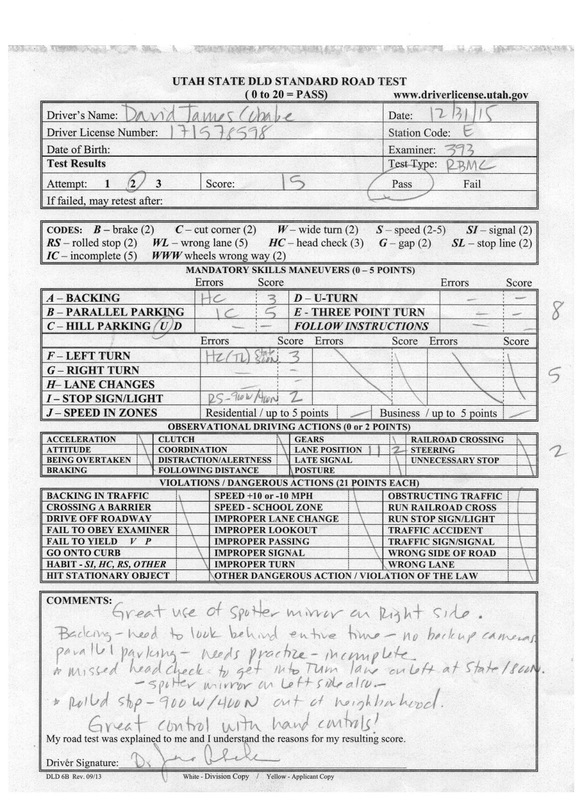 My suspicion is that the examiner passed me this time because she believed my pickup truck was under video surveillance - which it was - and she no confidence that she could get away with fabricating such an unjustified and outrageous test score as previous, with other people witnessing. I don't like video surveillance, but I could think of no other option to protect myself in this manifestly hostile environment. Her primary concern was that there was a little bit of snow on the roads. I have no such doubts about driving on snowy roads, and would venture that I have more cumulative experience driving in snow than the examiner has ever travelled on dry pavement. One of the violations she checked off was "RS", indicating that she was reporting a "rolling stop". Because of problems with automatic adjustment for light conditions, that portion of the video record of the incident is not conclusive, but the audio track clearly indicates that the vehicle made a complete stop for several seconds prior to accelerating for the right turn. The engine noise is unmistakable. It was funny to see that the examiner chose to instruct me to perform a U turn on a residential street - in my full sized pickup truck. Most would have easily recognized that the truck does not have a small enough turning radius and cannot complete a U turn in such a narrow street. 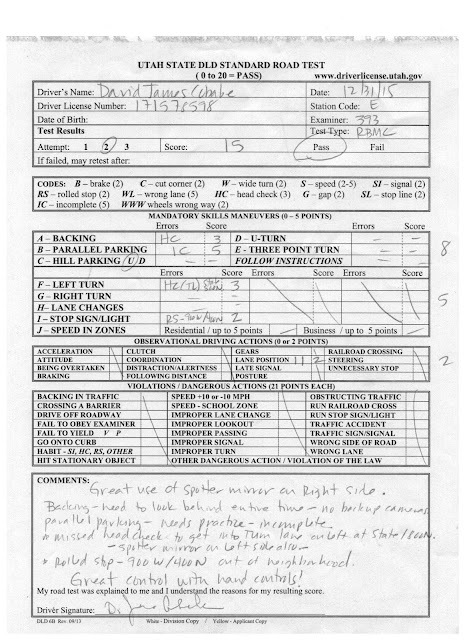 I also had to laugh about the examiner's imposition of the "spotter mirrors" requirement, after she observed my frequent use of mirrors during the test. In fact I have always made frequent use of mirrors. This "spotter mirrors" requirement is just an annoyance more than anything. She apparently noticed that my right hand mirror has a cheap cheesy convex mirror affixed. Two of these little mirrors were on the truck when it was purchased used, some years previous. They never bothered me, other than the barely significant useful mirror surface they waste. But this is an additional symptom of imposing meaningless arbitrary restrictions. The truck used to have another little phony mirror glued on to the drivers side REAL mirror, but it fell off somewhere, and I never bothered to replace it. The little mirrors never made any significant difference to my SAFE driving. The restriction to drive on roads of 40 MPH or less is fatuous and punitive from the beginning. I am certainly no better or worse at driving 60 than I am at driving 40. Another baseless "safety" restriction. I have no idea why anyone would have dreamed up the "daylight driving only" restriction. Indeed, I have no recollection that anyone ever formally tested my night driving, or questioned me more than in passing about any difficulties I might have had with night driving. I would have answered that I have never had any reason to suppose my nightime driving is any better or worse than any NORMAL driver. And neither does the State of Utah DLD. Just another inexplicable arbitrary and discriminatory restriction. As already mentioned, the hand controls were implemented by ME, as an adaptive measure to accommodate my physical handicap. None of the other restrictions can be realistically construed to relate to the hand control adaptation. But the DLD just had to list this, as if it were THEIR idea. Actually, I gave up all hope of driving with NORMAL pedal controls years ago. I only recently discovered the hand controls that let me drive my car nearly as if I could function NORMALLY. The "15 MILE RADIUS FROM HOME" restriction is another pointless and arbitrary restrictive measure that amounts to punitive. If I had the will, I could legally drive in circles for thousands of miles. This appears to be the intent of this silly restriction. I have a number of destinations I could and would travel to frequently if it did not violate my "restrictions". The compassionate and sensitive supervisor suggested I should just learn to rely on public transportation. I could tell from her attitude that SHE never does, and that she would never suggest this to any NORMAL person. The "spotter mirrors" requirement is just a ludicrous afterthought. I bought a new set from Amazon to install in my pickup for $3.00. I could not care less, other than the fact that it is an arbitrary and entirely capricious imposition. I cannot imagine that the DLD would even THINK to make such a silly requirement for a NORMAL driver. But for me, the IMPAIRED driver, it's just a great idea. So why not make it a "restriction"? As far as I know, I have never encountered one single person from the State of Utah DLD who has medical credentials, is board certified as a qualified medical practitioner, or who even is even reasonably well informed about medical handicaps. If DLD employees have no particular expertise that qualifies them to make judgements about medical issues, they need to defer to the opinion of those who ARE qualified to make such deliberations. I expected the DLD to actually LOOK at the recommendations my doctors make. When I see clear evidence that they are not even CAPABLE of reading a medical report, I don't believe they ever did. Instead, they just assume that medical handicaps must be a safety hazard. As a result of this bigotry, NORMAL drivers have not restrictions, while those labelled as medically IMPAIRED get much worse treatment than drunk drivers. Note that the restricted temporary license states that it expires in six months. Yet another arbitrary and capricious limitation that no NORMAL driver ever encounters. Oh joy! I get to repeat this senseless exercise, every six months. To be sure, I will work on improving my video surveillance technology. Thrilled at the prospect of enjoying such graceful accommodation at the State of Utah DLD!